Bimba & Lola Bags first surfaced on Chictopia's streetstyle gallery in Summer 2012 seen on Berlin blogger CATS_AND_DOGS of wie-hund-und-katze.com. She wore her white Bimba & Lola bag with a aquamarine Zara shorts, white Zara jumper, and aquamarine Nelly heels. Since then, Bimba & Lola Bags have grown in popularity as bloggers from Madrid, Barcelona, and Madrid have discovered them. Bimba & Lola Bags are generally seen in chic, casual, and trendy style. Popular types of Bimba & Lola Bags are fury, chic, bowling coco, leather bag, and clutch. Blogger's favorite colors are black, crimson, heather gray, and tawny. 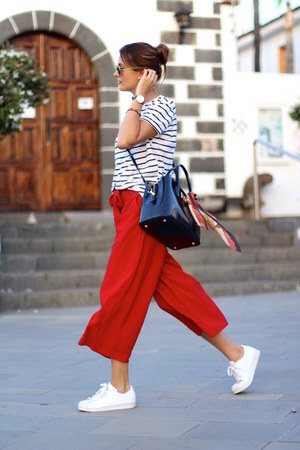 There are currently 205 streetstyle photos of bloggers wearing Bimba & Lola Bags. Most recently, blogger CATS_AND_DOGS of wie-hund-und-katze.com styled her white Bimba & Lola bag with a ruby red Topshop patform suede heels, maroon H&M patterned pants, and maroon H&M knitted jumper.